It was a perfect bluebird August day in Driggs, the kind we haven't experienced much this summer. 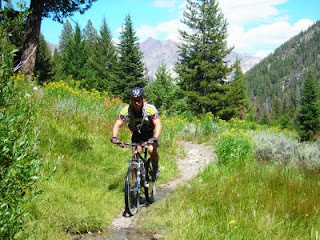 I pounced, and rode my trusty steed up Mahogany Creek...up to Elk Flats...up, up and up until there was no more "up" in the entire Big Hole mountain range. 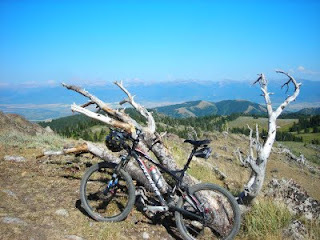 There I was, on top of Garn's Mountain, with the Tetons in the background, 360-degree views, and nary a breeze. Epic. The descent was pure nectar. 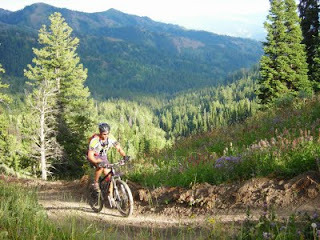 Total ride: 17 round-trip miles, 3,100 feet of climbing (& descending), less than 3 hours. Late summer fitness is kicking in, at last. Yes, I've been a bit of a bike-riding geek lately. Hey, it's a ridiculously short season, and you've gotta take advantage. Plus, LOTOJA is less than 3 weeks away. It motivates me on a daily basis now...the legs simply have to be ready. I did it as part of a 2-person team last year, and even that was painful. Doing 206-miles solo, across three states, with about 10,000 feet of climbing, promises inestimable suffering. Misery loves company, and 1,500 other riders will be out there with me. I'll take detailed mental notes of the pain as it unfolds, and relate it all here afterwards. 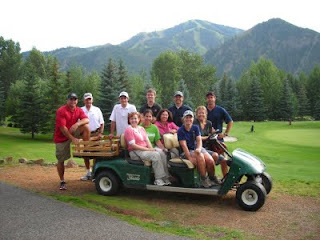 The extended family, after an annual round of golf in Sun Valley a couple weeks ago. A handful of those people are really good golfers...yours truly not among them. The key is to keep smiling. rick, headed to your area next week with family (including a 2 year old). can you offer an out of towner some beta on a good ride? 2 hours, nothing epic...just a good ride. ps, any SS riding around there or should i bring my gears?